Responds to being thrust into media spotlight by chewing on microphone. 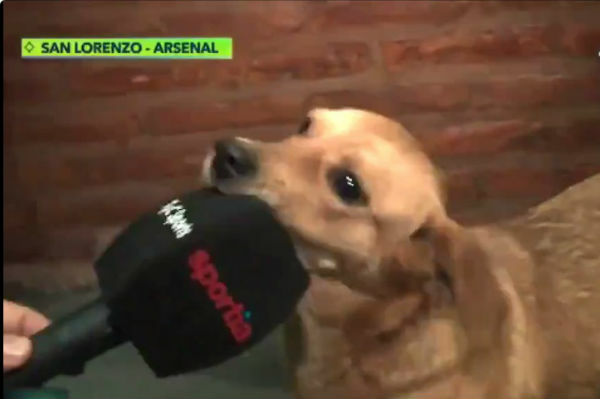 Watch as this adorable dog interrupts San Lorenzo v Arsenal de Sarandí in the Argentine Primera División before getting its own post-match interview. The playful pooch is not the first animal pitch-invader, but it might just be the first to face the press to account for its actions. During a 1-0 win for San Lorenzo, the dog steams onto the field of play and commandeers the ball, much to the players’ frustration and spectators’ amusement. Some of the players attempt to gently prise the ball from its grasp so that a corner can be taken, eventually requiring the intervention of a club member of staff to do so. After the match, the dog is thrust into the media spotlight but appears unfazed by the experience, simply chewing on the microphone. It has been suggested that San Lorenzo have kept the dog, believed to be a stray, for good luck.